I bought this game to play during a family get together. The object of the game is very simple -name 3 things that fit into a specific category in 5 Seconds. Here is the tough part, if the first player can't think of the 3 answers, it goes to the next player, BUT they can't repeat ANY of the first players answers! There is a timer that is included... a long yellow tube that makes a silly sound ( half the fun!! ) but when the game gets started.. there is sure to be LOTS of laughter and it may be hard to hear the "timer". We had "teams" because there was a lot of people that wanted to play, but we each just took turns within our team. If you / your team answer correctly, you collect the card. The winner is the one that has the most cards. 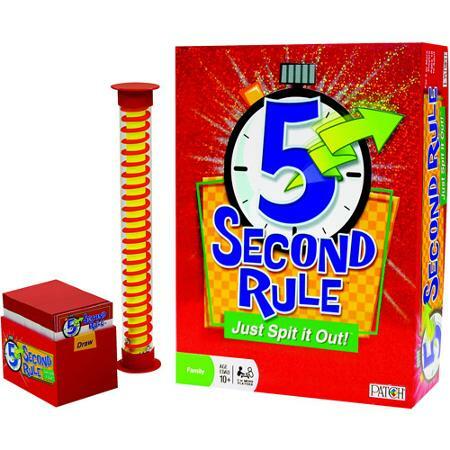 The tag line to this game is "Just spit it out" ... SO true, just yell it out! Great game... Game says ages 10+. I would agree with the ages listed...we had ages 16+ in our group and had a blast!